Hospice and palliative care nurses help provide comfort and give the patient information to make end-of-life choices easier. These nurses evaluate the patient and provide options to the individual and their family so everyone can make educated choices. Nurses in hospice and palliative care roles may need additional certification beyond a BSN. Intensive Care Units (ICU) are intense. It’s right there in the name. Nurses in the ICU need to be quick-thinking and fast-acting. These nurses provide 24/7 care to people who are in a hospital because of a severe illness or disease. Responsibilities typically include monitoring patient vitals, collaborating with physicians, and evaluating overall patient condition. Informatics nurses or nurse informaticists are at the center of all the medical data collected about patients. These nurses manage, interpret, and communicate the information in data systems that help with patient care. All that data work means informatics nurses’ technology and nursing science skills have to be on point. Nurse advocates are the ultimate intermediary. When the patient’s wishes are different from a doctor’s recommendation, these nurses step in to make sure patients understand the diagnosis and to help them find alternative care options. It’s equal parts educator, arbitrator, and counselor. OB/GYN nurses focus on education about puberty, menopause, and sexual health; helping during pregnancy, labor and childbirth; or conducting mammograms and other screenings. Some employers may require nurses to have specialized training before being hired, and others offer on-the-job training. Who needs better care than the hardworking professionals of healthcare? Occupational health nurses give preventative care for people who work in hospitals and other health facilities and ensure safety standards are met. Documenting employee injuries or illnesses, creating safety programs, and evaluating work environments are all in a day’s work for occupational health nurses. online program can help you keep working? Email an Admissions Advisor today! Specializing in the care of cancer patients and individuals at risk of contracting cancer is a job that varies greatly from day to day. Oncology nurses develop management strategies, provide prevention counseling, maintain patient health records, monitor physical conditions, prescribe medication, and administer chemotherapy and other treatments. This is a job that is both challenging and rewarding. 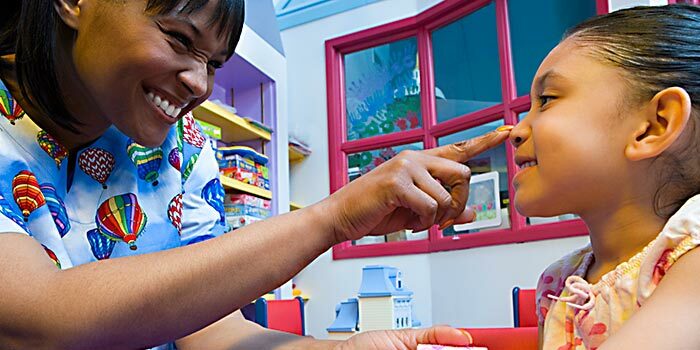 Administering developmental screenings, giving immunizations, and treating common illnesses are all included in a day’s work of a pediatric nurse. These nurses work solely with children to educate them on general health, proper nutrition, disease prevention, and offer critical care when needed. Nurses in this role typically need additional certification. Surgical nurses work with physicians and surgeons before and after operations. A day in the life of these nurses could include setting up IVs, taking vitals, and prepping patients’ for—and monitoring them after—surgery. Some highly trained nurses work inside operating rooms, handling medical equipment and surgical instruments. Choosing a specialty is an exciting step in a nurse’s career, but not one that should be made lightly. Talk to your co-workers, your friends, and your family to help you make the right decision. Once you decide, if you need to earn your BSN talk to us about the Madison School of Healthcare RN to BSN online program!